At 35 hours the main engine was serviced by authorized Cummins Service Technician. Northern Lights 6kw generator in sound enclosure. Two 215 A-hr AGM house batteries (in rack capable of holding five batteries), one 180 A-hr AGM engine start battery, one 180 A-hr AGM bow thruster battery, one 180 A-hr AGM generator start battery. Heavy hand-laid fiberglass solid hull construction. Vinylester resins used in the outer layers to prevent blistering. Epoxy barrier coating and hull paint below waterline. Integral grid structure is designed to provide a very sturdy hull with little flexing, as evidenced by the absence of gel coat cracks around the boat. Board from astern via a large swim platform though the transom door. The covered cockpit is large enough for several deck chairs. Two, optional side cockpit doors give easy access to the aft of the boat. The lazarette below provides a large storage volume. Beautiful highly polished hawsecleats make for convenient attachment of mooring lines. The sturdily-built wide sliding aft cabin door provides entry to the full-beam saloon, which is much larger than would be expected in a boat this size. The galley is forward starboard and features custom ordered granite countertops, a 9 cu ft Novakool over/under refrigerator/freezer, Force 10, 3-burner electric cooktop, and Contoure combination convection oven / microwave. An optional icemaker has also been installed in the galley cabinet. Just aft of the galley is an open space with storage lockers and a comfortable swivel, rocking chair. To port in the salon is the convertible L-shaped dinette (which converts to queen berth) with a storage cabinet and countertop/bar forward of it. Just forward and down is the day head -- complete with shower capability -- and an entry door into the engine room. The pilothouse is just two steps up from the salon and integrated into the living spaces. The L-shaped dinette allows three or four guests to enjoy the pilothouse while underway. The pilothouse settee converts to a single pilot berth. The helm station is to starboard, and features a sliding helm seat with a moveable bolster for leaning if desired. Forward visibility from the helm station is excellent, and because of the low pilothouse design it's possible to view the aft quarters directly from the helm seat also (unusual in a pilothouse model). Sliding pilothouse doors port and starboard allow easy access to the dock, the foredeck or to the flybridge. Hawsecleats are mounted directly outside the pilothouse doors enabling the captain to easily manage the midship lines while docking or tying alongside. The master cabin has a queen bed (with hinge and lifters for access to storage below), hanging lockers port and starboard, storage drawers, two storage cabinets, bookshelves, and separate head and shower compartments. The flybridge has two pedestal seats and an L-shaped settee. As with the entire exterior of the boat, the design of the flybridge is uncluttered and intended to be simple to maintain and easy to clean. There is a Bimini attached to the Radar Arch for sun shade. Three Webasto reverse-cycle systems provide heat and air conditioning. And for fresh air this boat has nine opening windows (including an opening windshield window), five opening stainless steel portlights, and two overhead Manship hatches. Dometic Masterflush heads. LED lighting throughout. Reverse Cycle heat and air are 12,000 BTU in forward cabin, 16,000 BTU in Pilothouse and 12,000 BTU in salon. Raw water wash down located in bow locker. Simrad 4G Radar / Chartplotting with multi-function displays both upper and lower helms. iCom M506 VHF, plus hand held, Glomex TV antenna, Davis Weather Station. 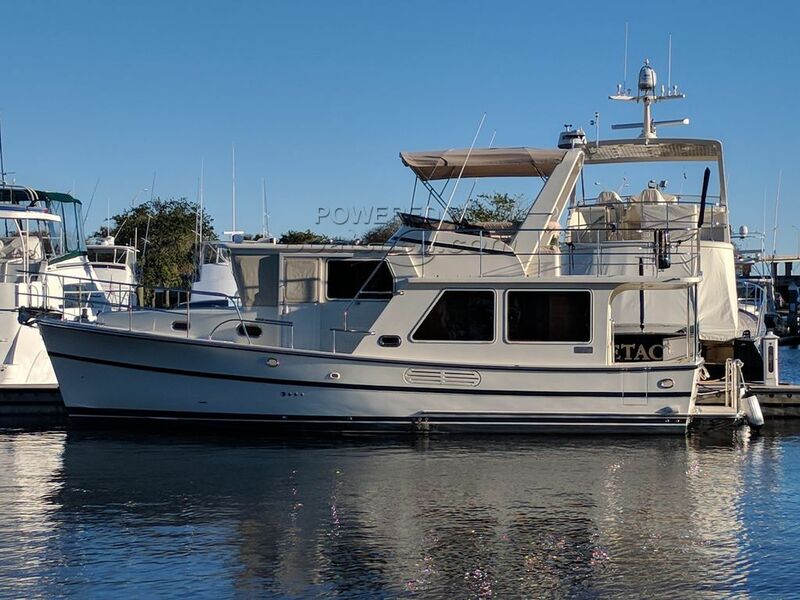 This vessel is a nearly new and heavily optioned Helmsman Trawler Pilothouse 38E version, the most popular model in the well-built Helmsman Trawler line. Delivered new in the summer of 2017 she has very low hours and looks as pretty as the day she arrived in Charleston, SC. Gel coat in champagne coloration, and with navy blue accent stipe this broker believes it's the nicest boat you could find to fill a 40 foot slip. The beautiful interior is clean and well-maintained. Special features include -- bow and stern thrusters, three reverse-cycle heating and air systems, Northern Lights 6 kw generator in sound shield, SIMRAD navigational electronics, Fusion stereo, hinged radar arch, and much more. This boat seems much larger than its size implies with a very roomy interior and a design that includes a full-beam saloon, a day head, separate master head and shower compartments, and an extended pilothouse that serves as a comfortable living area in addition to its piloting function. The quality of materials and construction are evident with teak and holly floors, beautiful teak joinery, heavy deck fittings and handrails, sturdy deck sections, and thick engine compartment sound insulation. Equipped with 480 hp Cummins QSB 6.7 litre engine it operates smoothly and quietly. She performs frugally at 7 or 8 knots, and has lots of additional power when needed. This Helmsman Trawlers 38E Pilothouse has been personally photographed and viewed by Gary Buck of Boatshed Seattle. Click here for contact details.